A Limited Liability Company (LLC), defines the liabilities of the company and it is limited to its shares. This is one of the oldest and most popular structures in the international market. A Limited Liability Company can be formed by a minimum of 2 and a maximum of 50 shareholders. To incorporate this type of entity, as per UAE law, it is mandatory to have a UAE national (corporate or individual) owning a minimum of 51% shares and the remaining 49% of shares must be allotted to the other shareholder in the company. Mainland companies benefit majorly by having access to the UAE Market. A mainland registered entity is allowed to carry out its business activities throughout the UAE market, It can work with anyone inside or outside the UAE and not restricted to just working within its freezone. a) A UAE National is mandatory in all mainland licenses either as a Local Partner or a National Service Agent. b) An LLC – Out of 100% shares, 51% of shares must be held by a UAE National and only 49% of shares are allotted to the expatriate partner. c) An NSA – whereas the business activities that fall under a professional license, 100% of its shares are allotted to the expatriate partner and a UAE National is appointed as a National Service Agent. For every mainland license, there is a minimum requirement of 140 square foot office space needed. Only once an Ejari (Dubai) or Tawtheeq (Abu Dhabi) has been presented to the Department of Economic Development, will they release the license. There is no limitation on the visa eligibility for a mainland entity, An Electronic Quota is issued to every company by the Ministry of Labor(MOL) which shows their visas eligibility and this can be increased by increasing the size of your office space. Per 80 square foot of office space gives you the allocation of 1 visa. If you also have staff who are not in the office, like sales, pro’s and drivers then you can apply for a separate quota for them and this will not affect your office space quota. a) A mainland license does require standard approvals for the license. For example, Department of Economic Development(DED), Dubai Municipality (DM), Ministry of Labor (MOL), Ministry of interiors or Immigration (MOI). b) In some cases, there are also third party governing approvals that will be needed, depending on your business activities: Knowledge and Human Development Authority(KHDA) for all Education related activities, Dubai Health Authority(DHA)/Health Authority Abu Dhabi(HAAD) for all medical related business activities, Food Control Department of Municipality for all food-related license, Civil defense for all security-related activities, Real Estate Regulation Authority(RERA) for all real estate regulated business activities. A freezone is a defined and isolated land or setting, with a special tax, customs and imports regime, that is different from a mainland area. The main advantage of owning a freezone company is that as an expatriate, you can own the business 100% without having to give out any of its shares. a) A freezone company can only conduct business inside is specific freezone or outside of the UAE. It cannot provide its services or sell its products in any UAE mainland UAE jurisdiction. b) The restriction of local business through a distributor is mainly to differentiate the business in the local market by mainland companies and freezone entities used for import/export. A distributor that has a Mainland license can act as your local agent and charge a certain fee which is lower than the 5% duty applicable on freezone invoices, if they trade directly into the local market. In case the company chooses to use a distributor, the goods should be shipped in through the distributor itself, if not, a 5% duty fee is applicable for any goods exiting the freezone. C) Marketing a freezone company can also be restricted as you are legally only allowed to market your company inside the freezone, may that be face-to-face or even handing someone a business card. 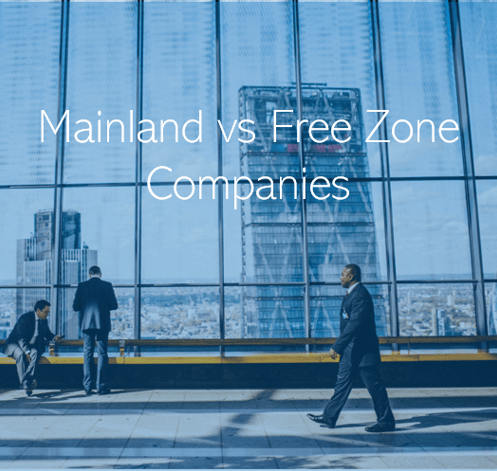 Compared to the Mainland, a freezone license is 100% owned by the expatriate. There is no need for UAE National partner/service agent. 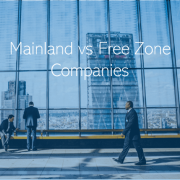 Unlike the mainland, a freezone license can be incorporated with or without a physical office. Freezone Authorities allows the license holders to use a smart/flexi office usage but this restricts you on visa allocation usage. Freezone companies are limited to a certain number of visas and this normally varies from 1-6 visa packages. If you require more than the allotted allocation, then you may be asked to rent physical space inside that freezone, this can be costly due to the limited supply but high demand of commercial space. The main purpose of having a freezone establishment is for importing and exporting goods and freezone authorities usually do not need approvals from external authorities. However, any external approvals from governing bodies outside of your freezone, will not be entertained.